EDMONTON - Lawyers have brokered a tentative deal to settle part of a class-action lawsuit filed over an E. coli outbreak and the largest meat recall in Canadian history. The lawsuit is against XL Foods Inc., which operated a meat-packing plant in southern Alberta during the tainted beef recall in 2012. Rick Mallett, a lawyer for the Edmonton law firm behind the class action, said the settlement is to cover refunds to consumers for products that were recalled. He said the proposed $1-million settlement, plus other costs, is to go before a judge early next year for approval. "The parties have reached a settlement on beef refund claims subject to approval of the court," Mallett said Tuesday following a hearing in Court of Queen's Bench. "It applies to anyone who purchased recalled beef — XL beef — and disposed of it and didn't get a refund." XL Foods recalled more than 1.8 million kilograms of beef in Canada and the United States. In its statement of defence the company has denied liability and the allegations contained in the class action. The plant in Brooks was sold to JBS Canada last year. In October 2012 Brian Nilsson, one of the chief executives of XL Foods, apologized to people who became ill and was quoted in the media as saying that the company takes full responsibility. If the court approves the settlement, a public notice will be published in newspapers in Canada and some U.S. states to let people know how to submit claims. Mallett said the agreement applies to anyone who threw beef away in response to recall notices, even if they can't identify whether it was XL beef. 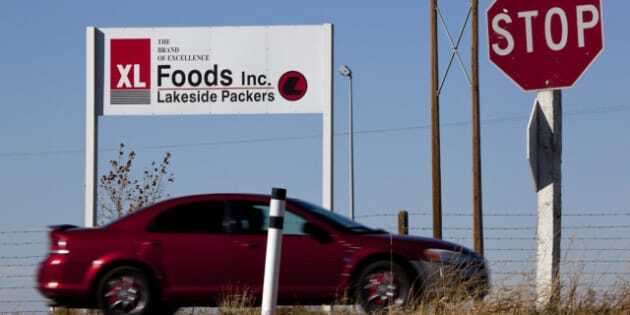 During the outbreak, health officials confirmed that 18 people in Canada tested positive for a specific strain of E. coli bacteria linked to meat from the company's plant in Brooks, Alta. The proposed deal does not affect the main part of the class-action lawsuit that involves people who claim they became ill.
Mallett said that part of the lawsuit could continue for another 18 to 24 months. He said the number of people who say they became ill is much higher than the 18 cases documented in reports on the XL Foods recall. "We have been contacted by, at this point, over 200 people indicating that they suffered illness or injury in various degree of severity." At Tuesday's hearing, associate chief Justice John Rooke said any public notice about the proposed settlement must make it clear that claims are separate from and would not affect any possible future claims for injury damages. The statement of claim — which contains allegations not proven in court — says XL Foods knew it had poor quality control and put its profits above the safety of consumers. Last fall, the court ruled that the Canadian Food Inspection Agency is a third-party defendant in the national class action. Mallett said the federal food safety watchdog is not part of the proposed settlement on beef refunds, but remains part of the injury lawsuit. "They remain in terms of the liability issues and any other quantum issues that relate to the bodily injury claims," he said. "They continue to be a part of the litigation."